Bagasse is waste sugar factories which are very disturbing if not utilized. Currently not many breeders use the bagasse for animal feed ingredients, this may be because the bagasse has a crude fiber with very high lignin content (19.7%) with low rough protein content (28%). but the waste is highly potential as animal feed ingredients. 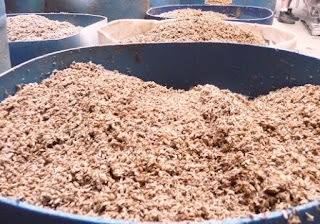 Through fermentation using probiotics, quality and level of digestibility of bagasse will be repaired so it can be used as feed material. Stages of fermentation equal to fermented bagasse straw, but need to add some ingredients to complete the necessary minerals in the feed material. Every 10 tonnes of bagasse are required 10 kg of probiotic Starbio, urea 10 kg, 2 kg of TSP fertilizer or SP36, ZA 2 kg. As in rice straw, urea is needed to increase protein content of bagasse Starbio with microbial content is needed to break down lignin and cellulose crude fiber so that it has digestibility of qualified for the cattle. TSP or SP36 fertilizer as a source of phosphorus. ZA as a source of sulfur. Nitrogen is needed to stimulate microbial decomposers on starbio to become more active. 0 Response to "Fermentation Bagasse for Animal Feed"